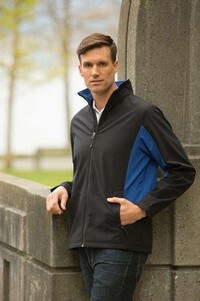 Coal Harbour Soft Shell Jackets offer technology and style at the highest level. 100% polyester outer and micro fleece inner. Contrast panels at sides and underarms, full length inner storm flap and a contoured fit. Stretchable, breathable, and wind and water resistant.